Click on Image to enlarge, pan with mouse. 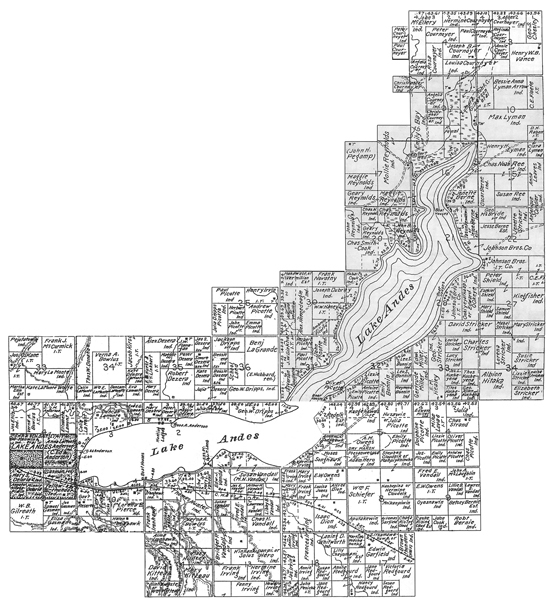 Yanktons chose to live around Lake Andes in family clusters, as shown in this 1906 map. Following the 1858 Treaty of Washington, which established the Yankton Sioux Reservation, the lake grew in importance as the Yankton land base shrunk from 11 million acres to just over 400,000 acres and bison ceased to be found east of the Missouri River. 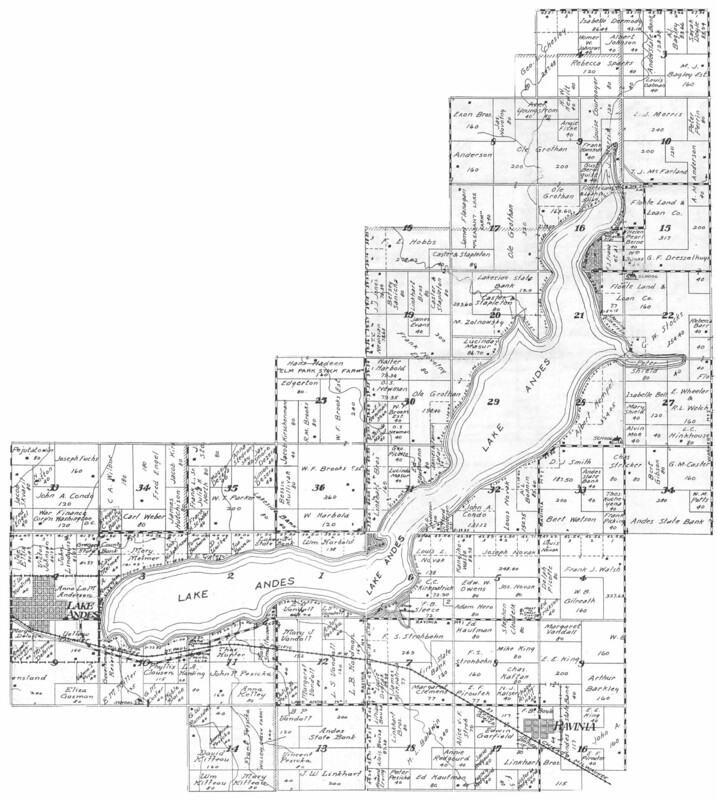 Yanktons knew the lake as Bde Ihanke and it occupied a position at the geographical center of the reservation while providing a social and economic hub. When the provisions of the Dawes Severalty Act (also known as the General Allotment Act of 1887) were applied to the Yankton Sioux Reservation, Yanktons rapidly claimed the land along the lake for their individual allotments. Along the southern shore, the Vandall, Irving and Dion families selected adjacent plots, on the eastern edge of the lake, the Picotte, Stricker and Shield families clustered together. The Cournoyer and Reynolds families claimed multiple entries on the north end of the lake and more Picottes and quite a few of the Dezera clan settled on the western shore. 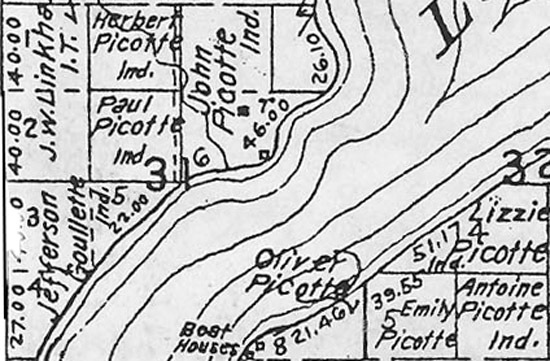 It is striking that Picottes and Strickers lived so close together, given that the former descended from Charles Picotte, who favored the 1858 treaty, while the Stricker family name traced back to Smutty Bear, who resisted the terms of the treaty.1 Despite the assignment of individual plots, Yanktons continued to regard the lake as a tribal possession. 1 Reneé Sansom-Flood, Shirely A. Bernie, and Leonard R. Bruguier, Remember Your Relatives: Yankton Sioux Images, 1858-1904 (Marty, SD: Yankton Sioux Elderly Advisory Board, 1989) Vol. I, 8, 11. By 1931, the lake had shifted to a recreation destination "famous for fishing," and nearly all of the adjacent land had passed out of Yankton hands. Of all the federal impositions on the lake – from creating the reservation as legal space, mapping and allotting the terrain, drilling the artesian wells and augmenting the lake's water – the 1899 addition of black bass seems innocuous. Yet one important result of bass profusion was it created a new incentive for whites to dispossess Yankton lands. This transformation was well underway by 1915, when the town of Lake Andes began to define itself through Fish Days, an annual celebration of the lake's prized occupants and a semi-official confirmation of a process that began seven years earlier with the opening of Amundsen Acres on the lake's southern end. The golden years of the bass fishery were in the late teens and early 1920s, when many small scale establishments dotted the lake. With increasing pressure from growing numbers of fishermen, the bass population dimiished by 1926, and a Fish Hatchery was added by the state of South Dakota to support the fishery. By 1931, only Rest Haven, Dream Land, and Bass Beach remained of the resorts, reflecting the decline of the bass population and the recreation economy, though the city of Lake Andes continued to celebrate the annual Fish Days. When drought combined with a carp eruption to eliminate the fishery altogether, the establishment of a National Wildlife Refuge in 1935 by the Bureau of Biological Survey raised hopes that the federal government might be better able to maintain the lake and the prized black bass. In 1906, Yanktons maintained strong family bonds, even as the influence of fishing began to appear on the landscape. Boat houses are seen on the lands of Jenette and Jesse Berne, though the family maintains over 350 acres. Yanktons of the Ree, Shield, Sticker, Cordier, Lyman, Leaves, and McBride families likewise own land in the immediate vicinity. The Johnson Bros. Company has made some inroads, suggesting the opening process of dispossession. 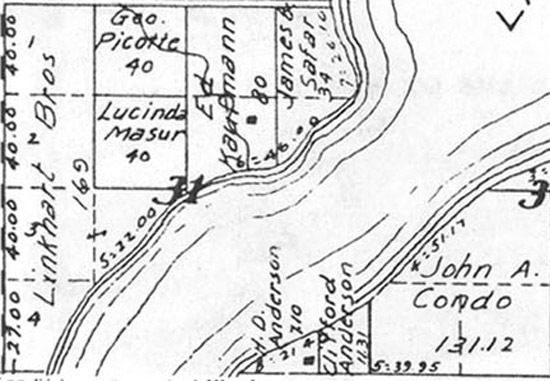 In the far northeastern corner of this map is one of the artesian wells drilled by the Office of Indian Affairs to stabilize the lake's level in 1896. Two years later the U.S. Fish Commission added black bass to the lake, setting the stage for a bass bonanza that would contribute to the loss of Yankton ownership of the land along the shore. By 1931, the recreation economy had displaced the Berne family. 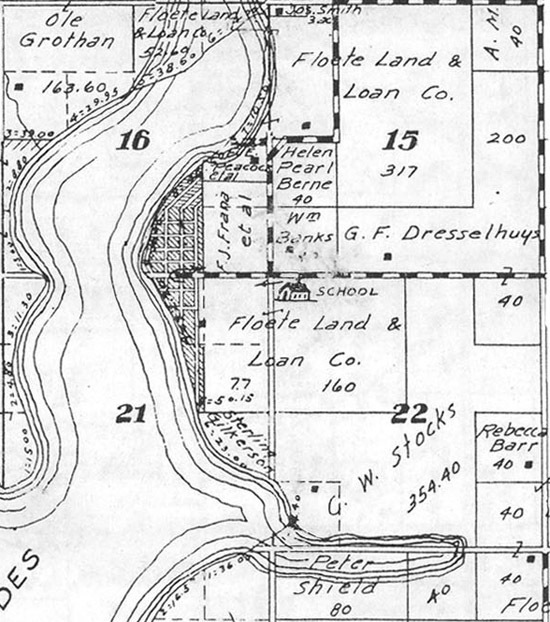 The Berne family plots, so prevalent in 1906 on the northeastern corner of the lake were reduced to one forty-acre section owned by Helen Pearl Berne. 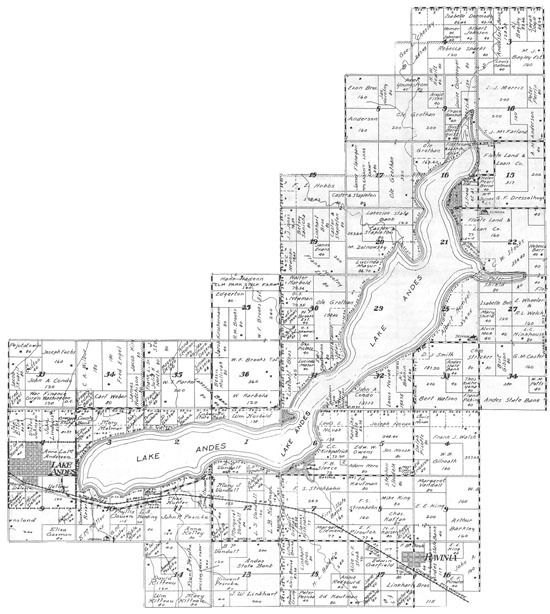 The subdivided plots bordering the lake in sections 16 and 21 were more formally known as Bass Beach, a bass fishing resort and subdivision. The presence of the Floete Land and Loan Co. reflects the tough economic conditions of the Great Depression, as individual land owners increasingly lost property to foreclosure. The government well no longer appears on the map and the artesian flow had stopped, allowing the lake to revert to traditional cycle of going dry during droughts. In 1906, Yankton Paul Picotte lived along the western shore of Lake Andes and spent much time fishing, especially for bass. Paul was born in 1879 and the southeast corner of his forty-acre allotment in section thirty of Howard Township bordered the lake. His brother, Herbert, claimed another forty-acre parcel directly north of Paul's and their father, John, possessed approximately 120 acres that abutted his son's land on one side and was bounded by the lake's shores on the south and west. Other Picottes lived across the lake on its eastern shore. Paul recalled all Yanktons fishing in the lake, from the banks and from boats, not just those fortunate enough to have allotments adjoining it. By 1931, only George Picotte claimed land in section 31, a forty acre plot removed from the lake shore. Replacing his family were the Linkhart brothers to the west and the Andersons to the south. The snapshot reveals the overall trend of Yankton dispossession around the lake, and highlights the prevalence on non-Indian land owners along the lake's shoe. A few years later the federal government would assume management of the lake, based on easements signed by property owners adjoining the lake. The federal government assumed management based on the collective assent of the property owners and an agreement with the state of South Dakota, but without any significant Yankton voice. 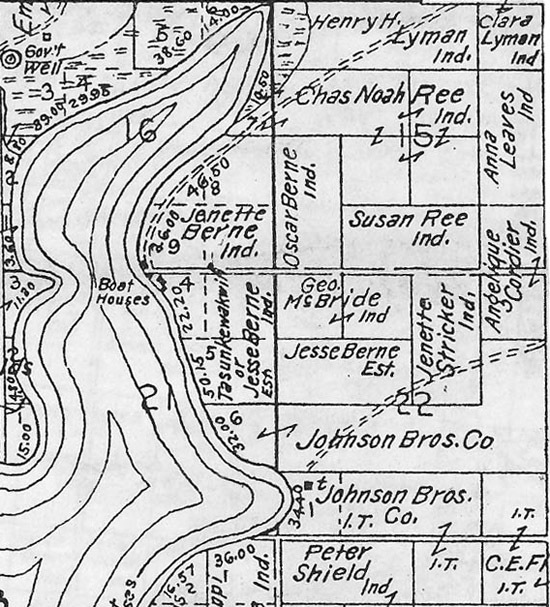 In 1906, Yanktons almost completely blanketed the southern end of the lake, with the sliver of land in plot 6 known as Dripps' Point. The land of Hermine Irving held one of the artesian wells that supplied the lake with much of its water. Just off of this map on the western end is the home of Albert Amundson who in 1908 capitalized on his land being between the town of Lake Andes and adjacent to the lake by building a boathouse and renting boats. Christened "Amundson Acres," Amundson later expanded what began as a single home to include cabins and a dance hall that doubled as a roller skating rink. The combination of boats, cabins, and a large pavilion became a template for other operators in the area that eventually achieved greater prominence, including Rest Haven and Bass Beach. By 1931, the southern end of the lake was thoroughly involved in the recreation economy, as Dreamland replaced Dripps' Point and Rest Haven occupied the former Irving land. Rest Haven enjoyed a position along US Highway 18 and was one of the most successful of the resorts that grew up around the lake. The state of South Dakota operated the Fish Hatchery on the same land, in part due to its proximity to the artesian well. Despite the active involvement of the state, by this period the fishery was struggling and would only get worse with the droughts in the coming years, causing locals to call for federal intervention to save the lake. Published by the Center for Digital Research in the Humanities. Funded by the Center for Great Plains Studies and the Plains Humanities Alliance at the University of Nebraska-Lincoln.